Tea drinkers rejoice! 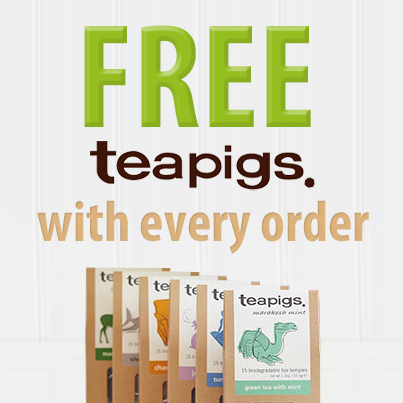 We’ve joined together with our good friends at Teapigs to offer a free cuppa with every order. We believe that the only thing that makes a good book better is a nice warm brew to accompany it. Okay, sitting on a sunny beach is probably a very close second, but that is a little beyond our powers unfortunately. So that is why we are giving away a free tea temple with any order on World of Books. Fans of Teapigs will be only too aware of their fantastic range of unusual flavours. As part of our giveaway, we have managed to secure three award-winning blends: peppermint, chocolate and popcorn. While not your traditional English Breakfast or Earl Grey, these unique teas will tantalise your taste buds. We certainly hope that you enjoy them and it encourages you to explore more of the Teapigs range. Indeed, as part of the promotion we are giving you the chance to get 20% off at the Teapigs online store. Just enter the code WOBTP13 at the checkout to take advantage of this great offer. But if you would like to get your hands on more than one free cup of tea, perhaps you might want to enter our latest competition. For your chance to win a whole hamper of lovely Teapigs goodies, just send us a picture of you enjoying your tea and book. It doesn’t need to be artistic, but we certainly encourage creativity. Include your favourite mug, where you like to settle down to read or whatever else captures your imagination. As long as there is tea and books, we’re happy. You can send your snaps via email, to marketing@worldofbooks.com, through our Facebook Page or on Twitter – using the hashtag #teaandbooks and sending to @worldofbooksltd. We will be selecting one at random on August 16th as well as sharing some of the best examples along the way. Best of luck to those entering the competition and we hope you all enjoy a drink on us this summer.